Symptoms of Cholesterol - Symptoms of High Cholesterol and of Low Cholesterol. This Symptom of Cholesterol is the same whether you have high or low cholesterol! How else can high cholesterol affect you? Could these be considered other cholesterol symptoms? Why aren't there more High Cholesterol Symptoms listed here? Could Hemorrhoids be a forerunner/precursor of high Cholesterol? Symptoms of Cholesterol - Symptoms of High Cholesterol and Symptoms of Low Cholesterol. Some Definitions: When we talk about the symptoms of cholesterol, we are normally referring to those symptoms of cholesterol that appear when either our good hdl cholesterol is too low or when our bad ldl cholesterol is too high. 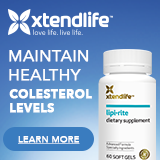 When we say our cholesterol is too low, we are invariably referring to our hdl cholesterol levels and, when we say our cholesterol is too high, we are normally referring to our ldl cholesterol levels. The signs and symptoms of cholesterol that you may be able to observe is just one, very lonely symptom, that you may easily misdiagnose as acne. The one and only high cholesterol symptom I have ever read about, was one published by Dr. L. Yong, 2006. She stated that to see if you have the symptoms of high cholesterol, look at the skin above your eyes. If you see any flat, yellowy looking bumps, then you have a symptom which may indicate high cholesterol. (Photo of this symptom of high cholesterol is below). According to Dr. Yong, the bumps are actually deposits of fat that can build up about the eyes when one has high cholesterol. 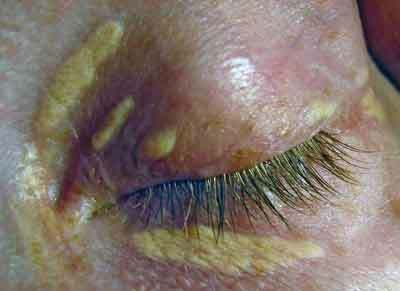 The photo / picture of this symptom of high cholesterol is above and I have since found out that it is referred to medically as "xanthelasma". Xanthelasma is defined as yellowish patches and yellowish nodules, primarily made up of cholesterol (fat) deposits with calcium salts perhaps mixed in with the cholesterol ( I do a lot of reading and research, so I find out a lot of interesting bits and pieces ). 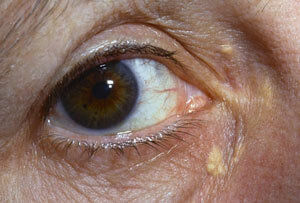 About 50% of people who come down with xanthelasma have a cholesterol problem. Of that 50%, some will have a high LDL cholesterol levels and the others will have low HDL cholesterol levels. Others will have both high LDL and low HDL levels. So, too much bad cholesterol can cause this symptom of cholesterol, while too little of the good cholesterol can cause this symptom of cholesterol as well. Here is another photo of this symptom or abnormal cholesterol levels - the longer you leave the cholesterol problem uncorrected, the worse the symptom of Xanthelasma can become. Age: You may notice these symptoms of high cholesterol, or these symptoms of low cholesterol, if you are aged over 15 years, particularly if you are in the 40 to 60 year age range. Surgery: If you try and get rid of this symptom of cholesterol through surgery, your success rate is only about 60% - 40% of people who undergo the surgery get them back. Diet is believed to play a part in these symptoms of high cholesterol and certainly, if you have too much of the bad cholesterol, you can often alter this through a low cholesterol diet and cholesterol lowering supplements. As stated earlier, this high cholesterol symptom may be due to other causes than high cholesterol. So, it appears best to get this symptom of high cholesterol checked out by a doctor if you have it. Remember, only 50% get this symptom of cholesterol for cholesterol reasons per se. For example, uncontrolled diabetes may cause this symptom of high cholesterol as well. Following on from that symptom of high cholesterol, I searched out many photo's to put here on this web site to demonstrate the symptom. Alas, the people who had these photos wanted around $2000 for each photo showing this high cholesterol symptom. Fortunately, I have since and at much lower cost, been able to source a photograph of this high cholesterol symptom which I included above. One really good thing that came out of that search though, was the finding that the symptoms of cholesterol - xanthelasma - can be found basically anywhere on the body, not just near the eyes. So, if you have little yellowy bumps on your arms, legs, stomach, anywhere really, they may be the symptom of high cholesterol, or of low cholesterol, showing itself to you. The size of each individual lump is about the size of a pin head. Normally there will be a cluster of these small lumps. Normally the skin around these cholesterol bumps will be yellowy too. Well, if those cholesterol deposits you see in the high cholesterol symptom photo above occur within the eye's blood vessels, blindness could eventuate, particularly if the cholesterol was cutting off the blood supply to the retina area. Same with the heart, too much cholesterol can cut the supply of blood and cause general weakness or even a heart attack. In short, the area where you can suffer damage is determined by where the cholesterol lodges itself. It's possible that gall bladder stones may also be a sign and symptom of high cholesterol, but this is still iffy. Gall bladder stones can be made out of cholesterol, as well as a couple of other things, but I did come across a surgeon who believed gall bladder stones were often caused by high cholesterol. The yellowy bumps are the one and only high cholesterol symptom, is the only high cholesterol symptom, I have ever found mentioned in two years of researching high cholesterol, that doesn't normally damage you significantly first. If you go to other web sites searching for high cholesterol symptoms, you will likely find a general statement that there are no symptoms of high cholesterol - that the only way to detect high cholesterol is through cholesterol blood testing. High cholesterol symptoms are very much hidden from view, they mainly exist in blood samples, or, if far enough advanced, in other health conditions, such as heart attack, heart disease, which are themselves the symptoms of high cholesterol in their own right for the most part. But here, I wanted to identify the early symptoms of high cholesterol, long before the high cholesterol has had a chance to cause all that severe damage. If any further early warning symptoms of high cholesterol come to my knowledge, they will be added here. Could Hemorrhoids be a forerunner / precursor of high Cholesterol? Although not strictly a cholesterol symptom, hemroids, aka hemorrhoids, may be an early warning sign of impending high / low cholesterol symptoms and problems in the future. Hemroids are mainly due to lifestyle factors - poor eating behaviour and lack of exercise - these causes of hemroids are often the cause for the good cholesterol to be too low, or the bad cholesterol levels to be too high. So chances are, if you have hemroids - whether internal or external hemroids - you may also have cholesterol symptoms / problems already, or be at risk of developing the silent or obvious cholesterol symptoms. So, if you have hemroids, you may benefit from having your cholesterol levels checked regularly and by paying attention to the high cholesterol symptoms you may be able to see - the yellowy bumps. In the meantime, remember that the yellowy bumps may be a high cholesterol symptom, but I had high cholesterol and from what I remember, I never had that high cholesterol symptom, except on the odd occasion for short periods of time - so the symptom can come and go. For most people though, the symptoms of high cholesterol will tend to stay and get bigger. If you are over your teenage years, it's possibly a good time to go for that blood test to check for the symptoms of high cholesterol in your blood - it should be a far better indicator of your cholesterol levels than the high cholesterol symptom stated here. If you have the low or high cholesterol symptom of yellowy bumps, then please consider seeing a doctor for a better appraisal of your health and cholesterol.